In the summer of 2015, I returned to a Pacific Ocean beachfront once again, in search of new stories about very familiar subjects. 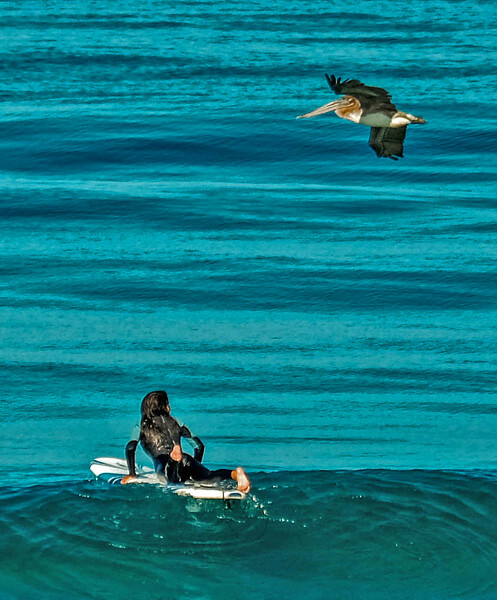 In the summer of 2014, I visited Imperial Beach, California for a month to photograph surfers in action, sunbathers, belly-boarders, fishermen, wildlife, street life, examples of public art, and spectacular sunset and dusk scenes. Each of those subjects presented an infinite array of variations and expressive possibilities. In that gallery, I demonstrated a principle I’ve always emphasized in my teaching: it is not what we shoot that is most important to expression. It is how and why we photograph a subject that can make all the difference in its meaning. In this gallery, I display images made on San Diego’s Mission Beach, twenty miles north of Imperial Beach. These photos continue to prove that it’s not the subject itself that tells the story – it’s our photographic approach to the subject that expresses our ideas. I shot the very same ocean, and very similar subject matter, yet the two places produced pictures that tell entirely different stories. Last year, Imperial Beach offered a pier to shoot from, bringing me much closer to surfing action. This year, Mission Beach provided a three-mile long ocean-front boardwalk filled with cyclists, skateboarders, runners, and walkers. Once again, I was able to shoot from an oceanfront condo, but this time around, I had a second floor balcony to shoot from. This made “people-photography” easier, since my high vantage point made me far less visible to my subjects. Once again I was able to photograph for a few hours on each of 27 different days. I varied light conditions by shooting during the morning, the late afternoon, sunset, and dusk. I amassed more than 12,000 images, and edited them down to about 400 keepers. I offer 75 of those images to you in this gallery. These photographs reflect my own interpretation of what I saw, felt, and imagined. Interpretive travel photography can express the personality and character of a place – even an entire country. Even more importantly, interpretive photography can go well beyond mere description. It can tell others how photographers may feel about what they see before them. Interpretive imagery helps us define the essence of a place – we can say something about our subject instead of merely showing what it may look like. As such, I try to make images that offer not only a sense of place, but also convey my impressions of how each place I visit feels and functions. My goal here is not to make a comprehensive documentation of the places I visit, nor a travelogue. Instead, I offer a series of interpretive photographs that express the personality and character of places I visit, as I perceive them. I continue to use a mirrorless lightweight camera to make all these photographs – a compact, weather resistant Fuji XT-1 body, offering both a huge internal viewfinder as well as a flip out LCD screen. A pair of excellent Fuji lightweight lenses offered me a range of focal lengths from 24mm wideangle to 345mm telephoto. Introduced in 2014, the XT-1 remains among Fuji’s flagship cameras. It focuses extremely quickly and it also allows me to make photographs at high sensitivity (ISO) levels without losing much detail. I use Adobe Lightroom and Photoshop software to correct and refine the hue, color, contrast and sharpness levels, hopefully making my pictures more vibrant and meaningful. Although all of these photographs were digitally enhanced to some degree, none of the content has been significantly manipulated. The facts are all here, as I captured them. I hope you will enjoy these photographic impressions.